However, this is not the first time the show has moved to a different location – viewers saw an exclusive set in the sixth series as Dancing On Ice moved from Elstree to Shepperton Studios in 2011. The 10th series of Dancing On Ice is set to return to TV in January next year. Once again welcome to the AGM. The Society has completed a successful year with our full range of activities – Shows, Talks, Outings, Plant Sale, Winter Social Evening and for the first time a Summer Social. The Society’s Shows are our major effort and continue to be supported by a strong following of exhibitors who achieve an extremely high standard. The Show Secretaries’ Reports provide fuller details of each show in a later agenda item. With the proceeds of the Winter Social in 2015 we purchased new display stands for use in the Shows for paintings, photographs, quilts and notices. ‘Single garage with padlock; eaves roof for additional storage. In quiet residential location in Bovingdon. £40/month. Short term or long term let. Immediately available. Our talk in February was given by Christine North on “Topiary”. This included a practical demonstration of the art and was attended by 18 people. The second talk took place in March when Graham Pavey gave us some ideas for “Vertical Gardening”, with a similar attendance. There were 2 outings in 2016 and a third had to be abandoned. On 18th May David Kirk of the Box Moor Trust led a group of 28 around the Bovingdon Brick Works. It turned out to be a fine evening and much was learned about the wildlife on our door step. The Second visit was to Rod Pengelly’s garden in Chalfont St Giles in June. Rod’s small garden is filled with 350 rose bushes for exhibition and another 150 on trial. It was amazing to see what he has accomplished and we thank him for inviting us and passing on his tips. The Society put up 34 baskets in the High Street, 1 more than in the previous year. The winners, as judged by Vic Coe were Fyfes, second the Memorial Hall and in third place Seaways; the presentations were made at the Autumn Show. The Village Gates continue to be maintained by some of our members – Sue Miller, Doreen Woods, Gillian Johansson, and Lindsey Coates and we thank them for their efforts to enhance the village. The Hemel Hempstead Cycling Club is pleased to announce The ‘Bovingdon Bomber’ Cycle Circuit! Courtesy of Drift Limits, we now have the use of a new 1km, traffic-free circuit for criterium racing and training events at Bovingdon Airfield, Hertfordshire. We run a series of regular mid-week evening criterium races under British Cycling rules which started in May and we will also be using the circuit for specific coaching, development and training activities for both adults and children. Watch this space for more news! This is a fantastic facility and we want to make maximum use of it for the benefit of our own club members, other local clubs and the Dacorum community in general. The Hemel Hempstead Cycling Club run the Bovingdon Bomber Criterium series at it’s club track – the popular Bomber Circuit. The series is governed by British Cycling and all races are Regional C+ events with full BC points and cash prizes. If coming by car then access is from A41 only. You need to leave the A41 at the Services (McDonalds) junction (signposted Bourne End Mills Ind Estate) and head up Upper Bourne End Lane which is off the northbound slip road. Access by bike is through the industrial area up Bourne End Lane off the London Road in Bourne End. Head right when you get to the top of Upper Bourne End Lane. There is no access through the main Bovingdon Market entrance. Please note, there is no public access to the circuit outside of organised events. Filming of Bohemian Rhapsody, about the British rock band Queen, has started at Bovingdon Airfield and is due to run all summer. Deadline.com (an online blog) broke the news last year that Bryan Singer was in talks to direct with Mr Robot star Rami Malek playing legendary frontman Freddie Mercury. Graham King is producing via his GK Films for 20th Century Fox and New Regency. The project has been in development with King for about nine years and the most recent script is from Theory Of Everything scribe Anthony McCarten. The film currently has a December 25, 2018 release date. 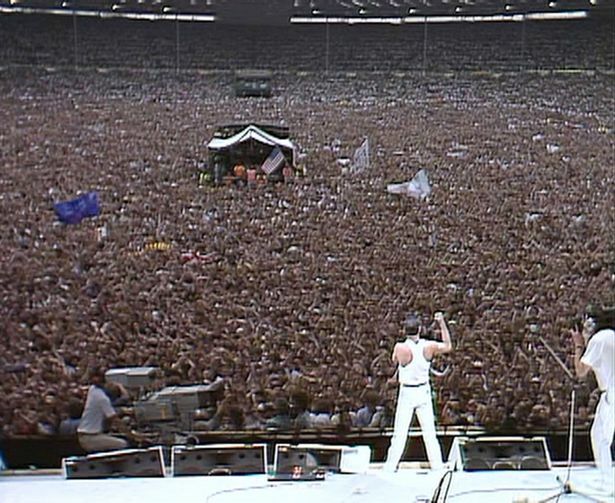 According to Queenonline.com, Singer is the “perfect choice to recreate the fabulous Queen years which brought us such unforgettable moments as Live Aid.” That 1985 benefit concert will be “faithfully recreated for a key sequence in the film,”. Malek as the strutting, operatically-voiced Mercury is “utterly dedicated to the project,” according to bandmembers Roger Taylor and Brian May. “He’s completely living and breathing Freddie already, which is wonderful.” Taylor and May are also executive music producers on the movie. As it turned out, the new recruit at John Hadland Ltd. had no need to avail himself of the substances available on site. He had already been to London armed with the same fake ID of “M.E. Evans” that he had used as a teenager, and bought a new batch of “antimony potassium tartrate” (the full name by which he insisted on calling it) and thallium from a West End chemist. Within days of starting work at Bovingdon, the new boy happily accepted the job of making tea for his workmates. The first colleague Young made friends with was 41-year-old Ron Hewitt, who was soon to leave the firm but had stayed on for a few weeks to show the new boy the ropes so he could take over his job. Two older members of staff, 59-year-old storeroom manager Bob Egle and 60-year-old stock supervisor Fred Biggs, also befriended Young, lending him cigarettes and money for his bus fare. However, after a time Egle began to spend periods off work ill. Around the same time, Ron Hewitt developed diarrhea, sharp stomach pains and a burning sensation in the throat after drinking a cup of tea fetched by Young. The symptoms lasted a few days, but doctors could only suggest food poisoning or gastric flu. When he was well enough to return to work, though, the symptoms promptly returned, invariably after drinking tea. Over the next three weeks he suffered no fewer than twelve bouts of this mysterious illness. “It’s very sad,” said Graham to colleagues, “that Bob should have come through the terrors of Dunkirk (a crucial battle of World War Two) only to fall victim to some strange virus.” Such was Young’s very vocal concern, he was chosen to accompany the firm’s managing director to the cremation. In the weeks following Egle’s death, the staff at Bovingdon tried to put the tragic incident behind them. Yet the rather work-shy young storeroom assistant insisted on continually musing about possible medical causes for Bob Egle’s bizarre symptoms. Then in September 1971 Fred Biggs also began to suffer the same symptoms. And he wasn’t the only one. Their ailments were put down to some kind of virus in the local area, which became known as “the Bovingdon Bug.” By unfortunate coincidence, a stomach bug had spread among the village children on a couple of occasions in the preceding months. Many workers speculated, just as the residents of Neasden had a decade before, that a contaminated water supply might be the cause. Others suspected radioactivity from experiments in a nearby airfield could be the culprit. If this was the same virus that had spread among the village’s children, it had certainly assumed a virulent new form. After briefly recovering from his first experience of Young’s unique approach to coffee-making, Jethro Batt fell ill again, and after a few days he was in such pain he later said he contemplated suicide. He remained in hospital for some weeks. Fred Biggs’ condition was the worst of the new outbreak. His condition deteriorated to the point where his skin began to peel off, and the pain was such that he could not stand the weight of a bed sheet on his body. Young’s pessimism was misplaced. On November 19 death finally came to Fred Biggs, as merciful release.